Talk about yummy and squishy! Tunisian crochet just seems to give the right amount of squishy bulk for winter projects. 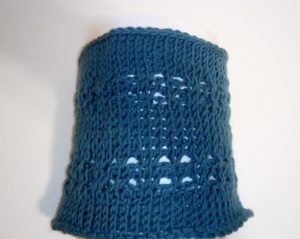 Take this cowl with its simple eyelet pattern. Made with a ball of DK weight yarn, it has a thickness that belies the yarn weight. The cowl is a quick project for those familiar with Tunisian crochet and my Tunisian crochet in the round technique. (If your afghan hooks don’t have cords, you can work it flat and seam it together.) Remember to block after finishing to open the eyelets up. Need help understanding the abbreviations and symbols? Check out the crochet abbreviation chart and the Tunisian crochet abbreviations chart. This entry was posted on Tuesday, October 25th, 2016 at 12:00 AM by Candace	and is filed under Free Crochet Patterns. You can follow any responses to this entry through the RSS 2.0 feed. You can skip to the end and leave a response. Pinging is currently not allowed. We have plenty of beginner patterns if you take a look around. Try typing “beginner” into the search box. Hope that helps!